I’ve had a lot of fun over the last few weeks. Not all of the fun events were exactly centered on Amara. Some were centered on her school. This post is about some of those school activities. The next one will focus exclusively on Amara and our recent fun together. Of course, anytime I do anything at Amara’s school it means I get lots of extra hugs and kisses just because I am on campus and I can! Plus these days usually involve seeing her before school and sometimes even afterwards, depending on how long I am there. Sometimes I am lucky and even get hugs from other students. A Grandma can never get too many hugs! Last month I volunteered for my third Movie Night. I got to be the greeter! Living in southern California, we can have outdoor movies on the grass in the middle of October and it will still be warm enough for shorts. Movie Night is a free event that the PTA sponsors each year. Of course, Jenna volunteered and Justin was the official “child wrangler”! He watched over some of the PTA kids while their Moms worked the event. The movie is free but they do sell food, drinks, popcorn and fun essentials like glow sticks! It was so neat to look out on a sea of shadows twirling and spinning glow sticks before the movie started. There were some technical difficulties and the movie started a bit late so it was a good thing the kids could entertain one another. The Tuesday before Halloween was the first FIBO art presentation at Amara’s school, another PTA sponsored event. It was also crazy hat day. I went with Jenna to help out, take pictures and just to enjoy it. It meant I got to see Amara before school and when her class came in for their presentation. I got lots more hugs! The presentation was about Osamu Tezuka, The Father of Manga! It was incredible and it certainly sparked the interest of the students. Over the next few days, they had hands on instruction in their classrooms, too. I didn’t get to be there for that but I did pick Amara up that day and she was so excited about what she had learned. The FIBO art presentations had been for Kindergarten through 5th graders. Thursday the PTA presented Italian street painting for the 6th through 8th grades. I was with Jenna at school all day as a volunteer photographer. They had the same wonderful artist last year. 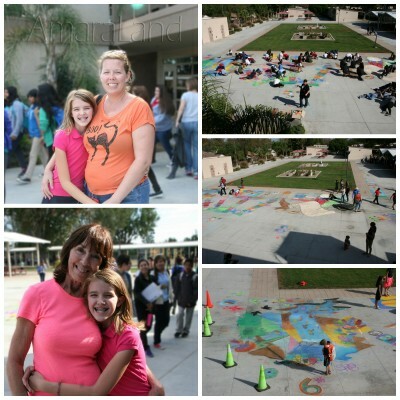 She helped them to create these beautiful chalk masterpieces. Again, we got so lucky with the perfect weather. The students loved it so much that after school was dismissed some of the students came back to do more! Some even brought younger brothers and sisters along to help, too. 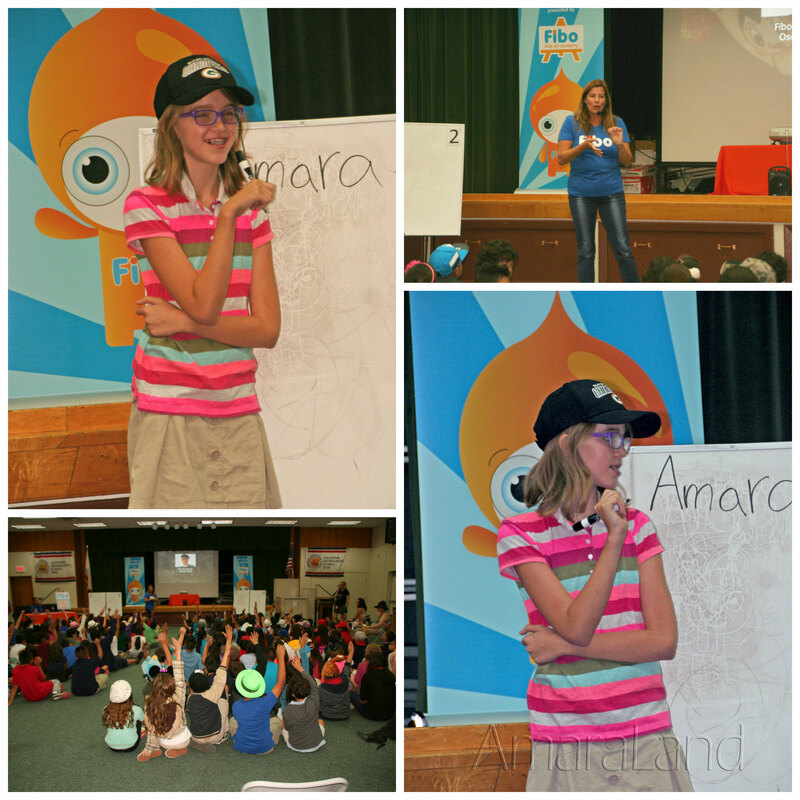 Amara is hoping they will bring her back again next year when she is in the 6th grade! I am so glad that we live close to The Kids and Amara and that I have the opportunity to be part of all of this! This memory was posted in Volunteering and tagged art, PTA, school, volunteering on November 5, 2014 by Grandma Kc. I am so glad that we live close to them and that I am healthy enough to enjoy all of this! I’m also really thankful that I have such a great relationship with my daughter. There are a lot of moms volunteering at the school who don’t have a great relationship with their own moms or have moms who would never consider volunteering. It is really sad as they are missing out on so much. The art events sound like lots of fun, and good exposure to art. Does the PTA sponsor this because the school budget doesn’t include enough art? The PTA sponsors a huge arts program for the exact reason that the school itself does not offer any art! We do a lot of fund raising to pay for it but I am so glad they have such a great PTA that does all this! You got some great pictures! So glad you posted then here so we can see your smiling faces!! This art presentation is really great! What a wonderful way to pique their interest and maybe find some hidden art talent they didn’t know they had! One of the highlights of the Italian street art was the 6th graders! They had seen the street art last year and so they were really looking forward to it! The instructor had also changed her presentation and slide show so that it was different than last year and kept the interest of the upper graders who saw it last year. It was also fun to see some of the students who didn’t really want to participate last year had a blast this year! I’m so glad I’ve gotten to be there. Looks like so much fun. There’s something energizing about being around so many excited children! There really is! I think being around the moms helps keep me energized, too! Once again Amara’s school seems to have THE best activities for the kids! And the best volunteers, too! The Italian Street Art event sure resulted in some great photos. Thank you for sharing the colorful fun and happy faces! Talk about colorful faces — there may have been a few students who helped to paint one another’s faces in chalk! And the hands! Even though the instructor told them to try and keep one hand clean they just couldn’t resist! But they certainly had a wonderful time and they were all very proud of their work. I love that outside art. I had not heard of that till reading it here. An outside movie in October, hmm. I’d love it too, but we’d all have soggy bottoms. The Italian street art takes sidewalk chalk to a whole new level! It is just amazing. The instructor did a video presentation to each class before starting and showed slides from some of the art she has done. The students just couldn’t believe what they were seeing. The sad part – at least to me is that it is all about creating the art. In Italy and other countries, once the piece is done they hose it down! So sad and strangely enough both years that the school has done it we’ve had rain the next day! Really odd when you think about the fact we are having such a drought and never get rain. Amara’s school is a shining example of what education should be all about. And you are a shing example of what grandparenting is all about! Thanks Olga! 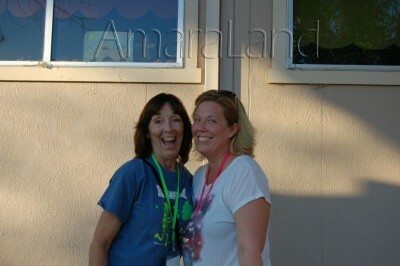 I have to say if it wasn’t for the amazing PTA at Amara’s school it wouldn’t be nearly as great! I am so glad they can help to pick up the slack for some of the things that have been cut from the budgets. I bet you both had fun at the dance! The one thing Amara’s school doesn’t allow is costumes for Halloween — I really miss it! All three generations of your family have been having fun which is documented by those huge smiles. Amara’s school sounds like one in a million and you are all lucky to be a part of it. The wide range of activities they include in their curriculum is beyond progressive. She really does go to a great school made even better by the involvement of the parents. I’m just really glad that both Jenna and Amara want me at school helping out. I’m always impressed at how Amara’s school covers so many areas of education and character development in such an engaging way. The kids can’t help but have fun! And the way grandparents are welcomed is an added bonus. School should be an extension of the home, not an isolated place to drop students off for the day. I imagine this school has high test scores – the result of academic pride that comes when adults are present to encourage and support. It is a great school made even better by parents! There certainly is a lot of academic pride and some amazing teachers, too. It certainly isn’t what you expect of your typical public school! What fun events, especially outdoor movie night!! And what a blessing that you get to be there and involved so much!! That I get to be involved is absolutely the best part – at least for me! I do think all those extra hugs keep me healthy! We are so lucky that we get to see Amara so often from practically the day she was born!!! She’s really growing up, she looks so poised up in front of the class. We may be the luckiest grandparents alive. Love all of the shots of smiling faces. It’s no wonder that kids would love Italian street painting…it sounds and looks like so much fun! It really was fun. Who can resist chalk? I love the idea of street painting with an artist. So much fun!